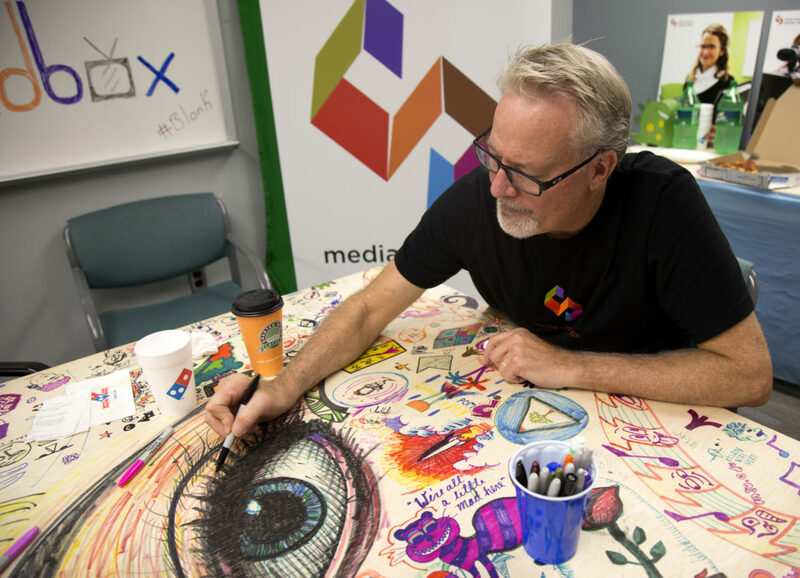 Karl Gude encourages students to let their creativity out on a large table in one of his meeting rooms. Photo by Katie Dudlets. Karl Gude walks into a lecture hall at Michigan State University on the first day of class. He faces nearly 500 students, some of whom are eager to learn about creative thinking and problem solving, others of which have their headphones in and a screen lighting up their face. Gude already knows how this semester will play out. He’s been teaching the same topic for over ten years. Standing in front of the class, he asks the students how many of them just want to know how to get a 4.0 in his class. Every single hand shoots up. This emphasis on assignment grades and test scores has stifled creativity in the classroom. According to an international study by Adobe, educators and parents feel the education system itself has become a barrier to creative learning. The study showed reliance on testing, restriction of educators from deviating from curriculum and lack of resources are perceived to be the biggest obstructions to creative teaching. “My contention is that creativity now is as important in education as literacy, and we should treat it with the same status,” said Sir Ken Robinson, professor emeritus of arts education at the University of Warwick in the U.K., in a TED Talk on the topic. Higher education students today are facing a difficult reality: The job market is constantly changing due to evolving technology. In a study by Pew Research, expert respondents indicated employers will be putting a higher value on the intangible skills and attributes of potential employees in the next decade. These are the exact skills that MSU professors are trying to foster in their own classrooms. While Gude is one of the few university professors who actually teaches creativity itself, he said he employs various methods to foster this type of learning in students. Video News Artist-in-Residence Mike Castellucci is one of the professors at MSU who prioritizes engagement in the classroom. In his Radio and TV News class, each student has a job, as if they are working in a real newsroom. There are producers, directors, teleprompter operators, floor directors and anchors. Everyone’s moving. “And that’s a lot more creative than just doing a lecture,” Castellucci said. MSU Digital Media and Film Production Manager Pete Johnston brings out creativity in his students by incorporating challenges into each assignment. Some of these obstructions include creating a video with only five shots that are five seconds each, or making a film that can’t be edited after filming. Students have to find innovative ways to get around the challenges, and Johnston finds that they like having to overcome the barriers. One of the roadblocks to teaching creativity in the modern classroom is students are often afraid of failure and unfortunately, creating a space for exploration and the possibility of failure without consequence isn’t exactly common practice in most schools. Johnston has found establishing a judgment-free environment is one of the most successful ways to get students to be more open to sharing their creativity. It’s often been said children are naturally more creative than adults. Their lack of inhibition allows them to be open-minded and free to explore themselves and the world around them. Brad Willcuts, a musical theater and choreography assistant professor, believes thinking like a child is the only way to be creative. One has to accept they’re not an expert and take on the mindset of a continuous learner. Children typically act on impulse. They’re testing the boundaries to see how far they can push them. This is exactly what Willcuts tries to champion in his musical theater classes. According to a Pew Research study, more Americans tend to support education that emphasizes creative and independent thinking over the prioritization of basic academic skills. However, while art and science are often deemed to be opposite, many professors feel the capabilities and attributes that come along with creative thinking can aid students in other aspects of their collegiate career. Take his student Ellie Weise for example, who’s earning her bachelor’s in genetics and who also happens to have a minor in musical theater. However, this extension into other disciplines doesn’t simply have to relate to one individual. Take Media Sandbox in the College of Communication Arts and Sciences for example. It’s a creative community and media curriculum focused on bringing together students with various creative skills to solve complex problems. In much the same way, Robinson likes to think of intelligence and creativity as dynamic and wonderfully interactive. As head of the science outreach program on campus, Weise works alongside Patrick Morgan, the department of Physics and Astronomy’s outreach coordinator to get students in K12 excited about STEM at an early age. But it’s hard to capture and maintain the attention of fourth graders when the topic is a complicated math or science concept. Morgan attributes his ability to do so to his own creative background. “I have always been passionate about the sciences, and with a theater minor, I can better show that passion I feel and give it to an audience,” said Morgan. Through the program, Morgan has employed handfuls of college students to assist in presentations and demonstrations to a K12 demographic. Their creativity and dedication to student understanding inspires him. At the university level, a professor’s role is to help students develop the skills they need to succeed in the job industry post-graduation. As technology increasingly becomes more advanced, and the world’s problems get progressively more complicated, creative and innovative problem solvers are what employers are looking for. As Gude tries to prepare 500 students for life beyond the university, some will surpass expectation while others will fall prey to mediocrity. Katie Dudlets is a dual major in journalism and professional writing. In addition to the Spartan Newsroom, her digital and editorial work can be found in The Offbeat, Fourth Genre and on ComArtSci's website. Choosing what grade and where you are going to teach is a huge life decision for teachers. I sat down with five different teachers at different levels to figure out their thought process and how they figure it all out.